The first fall after we moved into our house 16 years ago, my mother-in-law bought me a collection of tulips. It was a sweet gesture and one that was particularly lovely the following spring when they all shot out of the ground and showed that hint of color as their tight buds started to open. 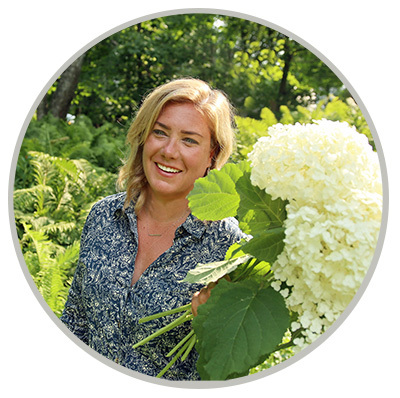 I was a novice gardener and these were real flowers that I had grown and it was so easy! And then, they were gone. If you have deer or rabbits that visit your garden you might know where my tulips went. They are, apparently, a highly tasty treat. A few escaped the wrath of those wretched nibblers and provided enough beauty to make me forget what happened to my tulips by the following fall. I finally gave up on tulips. I turned to other bulbs that are distasteful (or poisonous) to wildlife like daffodils, alliums and muscari for my spring color jolt. But I still have a little spot of affection for tulips, the most springy of all flowers. But I don’t think I realized how much I missed growing tulips until I started looking online for my bulb order (see what I ordered here). Clearly I’ve been avoiding looking at them for a lot of years, because surely I would have caved earlier if I had been. The wonderful news is that I will have tulips next spring. In fact, I plan to have many tulips next spring. Enough to pick them and bring them inside to brighten dreary early spring days. All of this is a side benefit of the new vegetable garden. 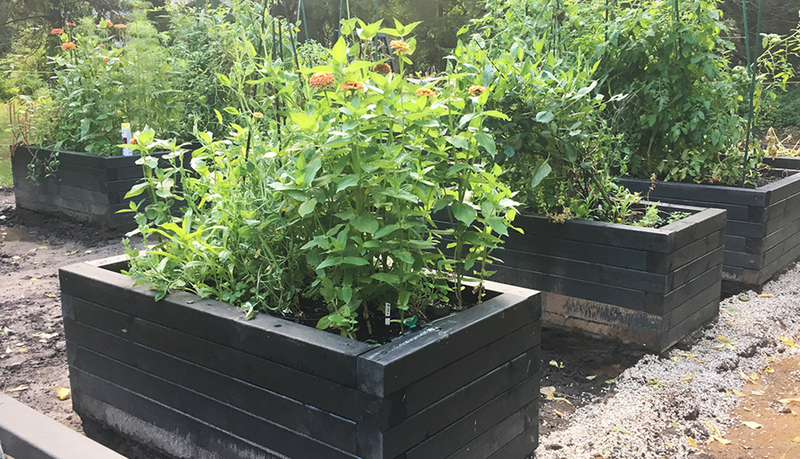 You may recall that in the center of the (still unfinished) garden I have four smaller raised beds in which I’m growing flowers for cutting and to draw pollinators. But I have no plans for these beds in winter and early spring. So why not stuff them full of tulips? These raised garden beds (excuse the mess as this area is still under construction) will make a perfect home for tulips, which will be protected from deer and rabbits that have a bad habit of eat them as soon as they form buds. Since there will be a fence around the garden by spring (knock wood) they’ll be safe from all the critters that are tulips’ nemesis. (Well, maybe not all, but I’m hoping that the squirrels ignore them.) Narrowing down what I wanted to grow was nearly impossible, so I decided on combining multiple tulips in each bed for a bright and certainly not boring look. I also choose only early and mid-spring blooming varieties so the beds are clear for sowing seeds in later spring. Longfield Gardens did the work on this one, create a pre-made mix of dark purple, cream and purple striped varieties. 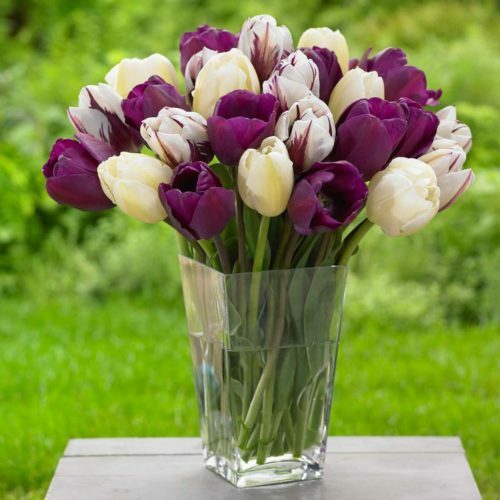 Dark tulips are so exotic! 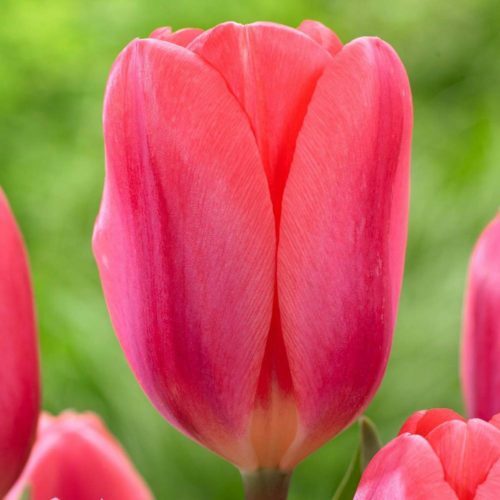 I love the freshness of green striped tulips but I also wanted a tulip for them to play off of, which is where the true pink Cosmopolitan comes in. I don’t love a lot of red flowers, but red tulips are a different story. (Sidenote: Red is one of my favorite colors so I can’t explain what my issue with red flowers is.) They are, to me, the quintessential tulip so I couldn’t be without them. This pre-mixed combo also features a pale pink that will look good with everything else I’m growing. This one doesn’t have a partner but that’s because with all its complex colors, I think this will look great just massed by itself. I never get sick of that orange and pink combination. Longfield also has a number of other pre-designed collections incorporating multiple kinds of bulbs and a variety of color mixes if you don’t feel like digging in to all the options as much as I did. I was just having so much fun looking at all of them that I couldn’t help myself. If you’re thinking about growing tulips in a raised bed like this, plan on packing the bulbs in tightly. Throw out all that information about spacing and really try to pack them in there! 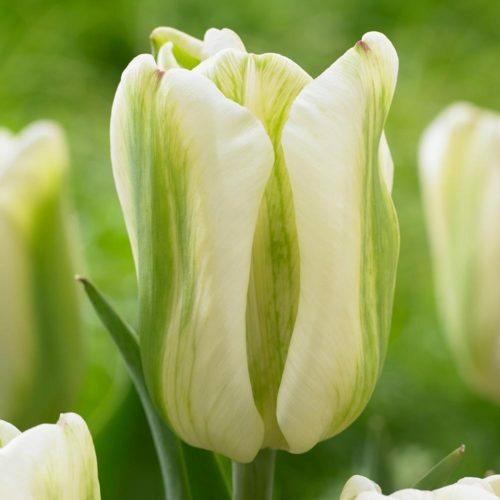 A friend who grows tulips in her raised beds suggests planning on 16 bulbs per square foot to get a full-on Keukenhof look. So you’re probably wondering what will become of these bulbs once they have finished blooming. And some of you might be horrified by my plan. I’ll be growing these as annuals. 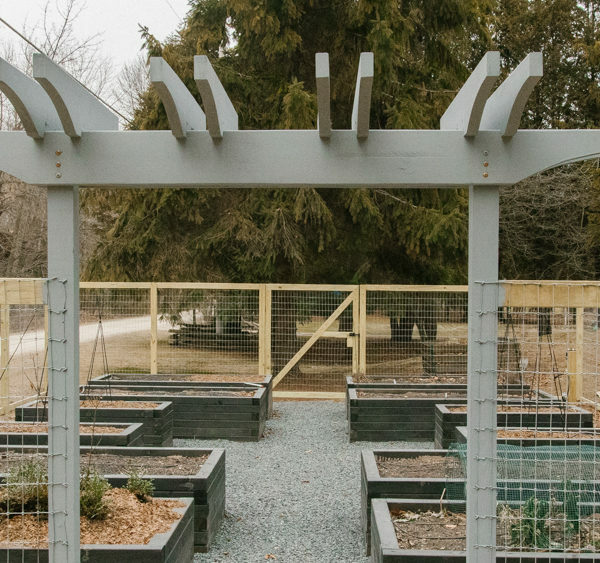 The fact is that I’ll want that space in the raised beds for other things so there won’t be time for the foliage to die back naturally and reinvigorate the bulb. 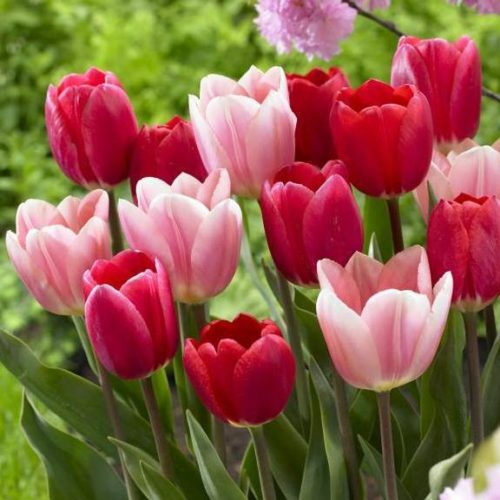 Honestly, sometimes it works best to grow tulips as annuals because unlike some other bulbs that can naturalize, tulips just seem to get weaker and weaker each year. I’m as excited about seeing these tulips bloom as I have been about anything in awhile. That excitement is only tempered by the fact that I know I’ll have to get through another long winter before I will get to seem them do their thing. The thought of these blooms might make that a little easier. 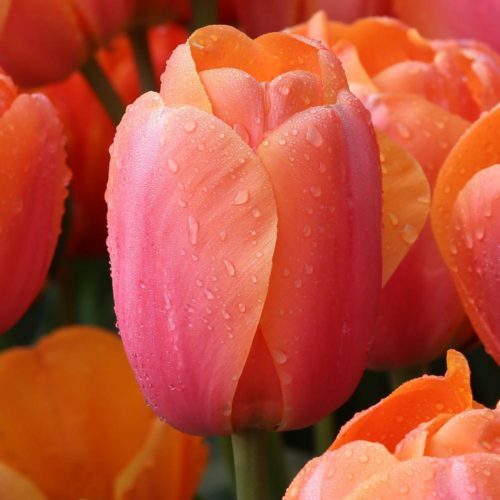 If you grow tulips, I’d love to hear about what kinds you like to grow and where you grow them. Longfield Gardens was nice enough to offer me some tulips to try out. It was so much fun to shop their selection! I’m fascinated by the way the stems of tulips lengthen after they’ve been picked. They arch and and flop and reach for the sun. So graceful. Yes! They just know what to do, don’t they? Good tip. I may just cover the beds with chicken wire or something if it becomes an issue and take it off when they wake up in spring. Knock on wood, I’ve not had a lot of issues with bad behaving squirrels, but we certainly have a good population of them. Placing poison in the form of moth balls in the garden is perverse. Maybe the scent drives off rabbits but the toxins released in the ground will kill insects, microbes, etc. A child could get hold of a moth ball. Flowers are not more important than wildlife and an environment that has not been poisoned. I have the same love of tulips and the same problem with deer. In our old house I grew tulips for years and then the deer started wandering in and the yard was never the same. We have the same deer problem in a new home. We have a fence around the back yard. So far they have been too lazy to jump the fence. I have planted things they don’t like outside the fence and things they like inside the fence. For the first time in years I enjoyed beautiful flowers and vegetables. I planted vegetables in very huge grow bags from the big box store. 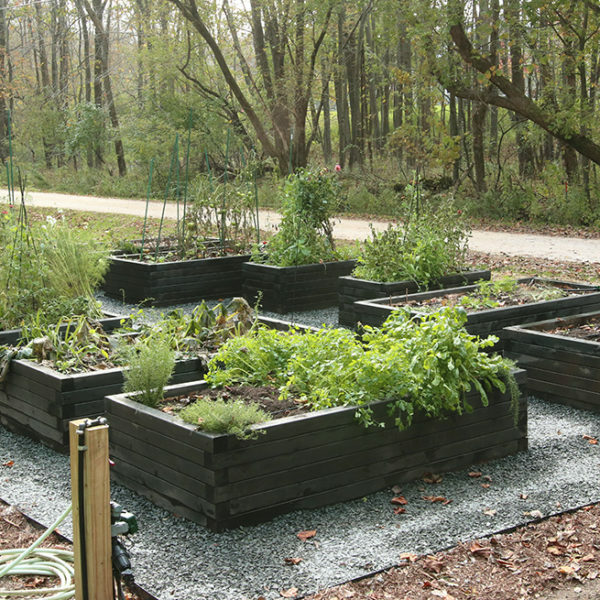 It was an easy solution to having bad soil and not building raised beds. I plan to plant tulips in the bags and hopefully see tulips again. I will plant the bulbs they don’t eat outside the fence. It will be wonderful to maybe have tulips after so many years. I had moles, or voles eat the bulbs too. The bags should stop that problem as well. Great idea! I find that the deer here are pretty lazy too. If there is something that impedes their progress they are happy to just move on to eat something else. My tulip problem is from squirrels inexplicably lopping the buds off of my tulips and leaving them lie there on the ground beside the plant. At least if they were eating them I could justify it as nature’s cycle of life, but this just seems some mischievous game they play. Nonetheless, every few years I try again. All of a sudden we we have these damn rabbits appearing, nothing scares them away except the water hose. I am about ready to purchase a BB gun or a pellet gun to scare them off. One of the said rabbits decided to have some babies in the middle of our lawn, we didn’t know it until my husband was mowing, I think he got one but he moved the other ones to the neighbors sanctuary, ha! They eat everything I have. Gotta do something here, so no tulips for us right now, oh how I love tulips. I would be careful about using mothballs in beds where you may want to grow food. 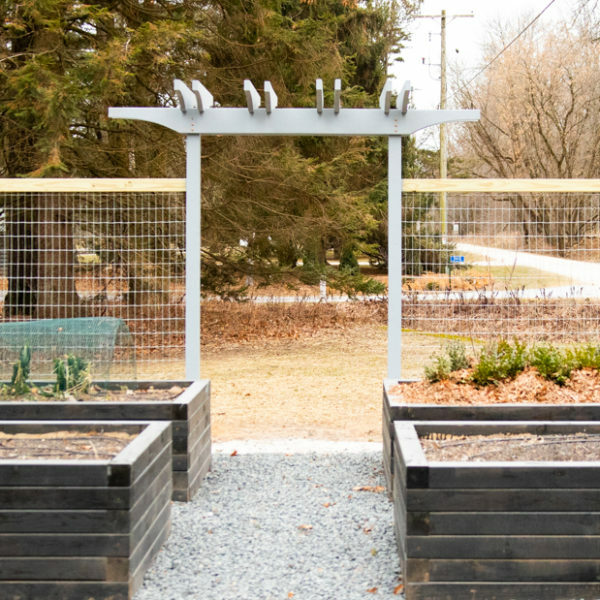 I think chicken wire is a better way to go. I ordered 60 Tulips and am still trying to figure out if there is any way I can protect them. Your new setup is so perfect; I am totally jealous. I am putting orange and brown Tulips among some Astilbes that come up with bronze leaves quite early and I am hoping that will confuse the bunnies (Ha!). I am actually thinking of caging that entire bed. Then I am getting two groups of Tulips that supposedly naturalize: yellow T. sylvestris and a reddish orange T wittallii. Both are smaller than the fancies and I am hoping that buying 15 and 25 bulbs means a few will survive. My best survival and re-bloom rate is out in my traffic island garden where it is dry, sunny, rocky and gets no extra watering. Have to agree that despite all the critter problems, I am helpless when I see Tulip catalogs. 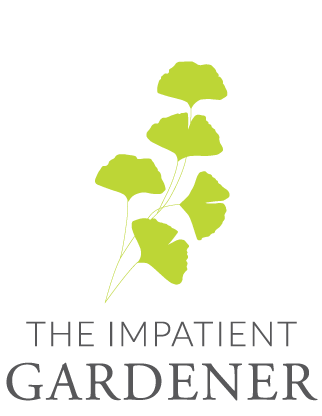 I ordered mine from Brent and Becky and Old House Gardens. These nibblers are also what’s holding me back to growing tulips in my garden and apparently, we have a lot of them. Thanks for sharing this. Perfect Year to plant tulips! 2018 has been designated the Year of the Tulip by the National Garden Bureau!